Painters Apprentice and supervisor in training. Zach has been with B&K Painting longer than all employees except John. 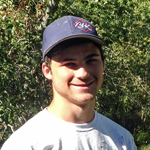 Hardworking and eager to learn, we are pleased to have Zach working for B&K Painting. Zach is a fast learner and is picking up the trade fast. Zach has progressed to setting up the job site including sprayers, spraying most tasking including cabinets. Zach is learning the art of masking, cutting in, painting cabinets, spraying exteriors, fixing runs, and is doing a great job at it. Zach has also taken on the task of helping the crew prep houses, running a power washer, and has showed skills in caulking. A neat, clean, and polite worker, Zach is a great addition to our team. Zach can be found on the Paint Ball field or hunting when he is not working.